Descending after Sayat Sayat checkpoint. Hike with the shoes that you will be wearing to climb Mt Kinabalu. Don't wear a shining new sport shoes or new hiking shoes that you have not tried before to climb Mt Kinabalu. Uphill hike along Summit Trail. For those who stay near Klang Valley in Malaysia, I highly recommend to hike at Gasing Hill for training. The last stretch of about 300 steps of uphill walk to reach the peak of Gasing Hill is very similar to the trail of Mount Kinabalu. In fact, many climbers choose to train at Gasing Hill before their 'real' climb at Mount Kinabalu. The photo below shows terrain of Gasing Hill, which is very similar to that of Mount Kinabalu. This is not Mount Kinabalu. This is Gasing Hill. In preparation for our climb, we also tried Broga Hill at Kajang. The view in the morning is stunning. Broga Hill in the morning. 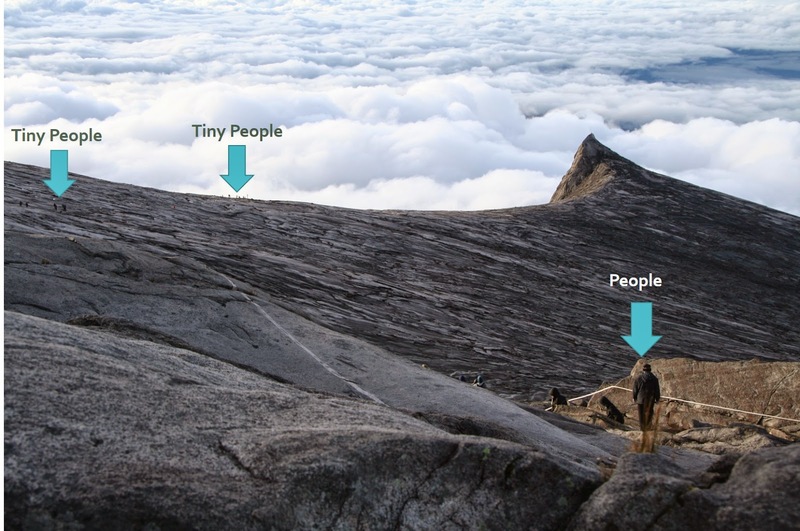 There are more hills that you can train to climb Mt Kinabalu. This is only a small list. Avoid accident prompt hill like Bukit Tabur. There were a few fatal accidents happened in this hill. This hill is truly not for beginner. Preparing your body for a long hour uphill (and downhill) walk. In this article I compared the training and outcome of a few of my friends. How to walk down hill? In this article I explained the methods to avoid knee pains, one of the most common problem in climbing Mt Kinabalu. We can divided Mount Kinabalu terrain into a few stretches in general. The 6 KM before Laban Rata. Terrain After Laban Rata, before Summit. Terrain After Laban Rata before the summit's plateau. Walking on the summit plateau. I truly hope the photographs above show you the reason why training is so important before attempting to climb this majestic mountain. Your body need to be ready.